SearchReSearch: Wednesday Search Challenge (5/16/12): Difficult--Where on earth...? As for the year - between 1995 and 2009, as that was the time the airline operated as Air Fiji. I couldn't get any closer than that, as I was limited by the fact I could find the tail registration of the aircraft (DQ-TRI) which would be the natural way to find out the location, operator and times of operation. I'd say you are at Matei Taveuni Fiji. 16°41′26″S 179°52′37″W, runway is 910m or 2,986ft. Air Fiji cease in 2009 so the picture is prior. Vegetation grown matches 2004 photos so I'd say about 2004-2005. Took about 20 minutes, identified by tail moniker DQ-TRI, leading to jetphotos.net and wiki on Fiji Air and similar pictures. 1. I searched for the airplane registration of "DQ-TRI" which "DQ" indicates that it is registered in Fiji. actual search "dq airplane registration"
2. Found fiji airlines wiki. 2nd item down. The airport is Taveuni Island in Fiji. The picture was taken prior to 2009, as that is when the airline went out of business. The runway is 910m (2986 ft) in length. Picture was taken in 2004. How: There are 3 things to gather from the picture. A) It's somewhere tropical. B) This is a small charter aircraft. C) the plane has a tail number. Now, the DQ-TRI is a registered aircraft, therefore searchable. Doing a quick search of "DQ-TRI" and plane tail number resulted in the result with reference to Fiji. So, now that we had two of the three components, we look for the last remaining item, who is the operating charter company, and where do they fly in/out from, since Fiji has several airports. Doing a search for "Air+Fiji plane "dq-tri"" brought me to "http://www.thefreelibrary.com/Aircraft+Finance+%26+Leasing+News+-+Asia+%2F+Pacific.-a0214944717", and onto the link for Air Fiji. There I saw the picture of the plane, location, and year of when the photo was taken. Doing another Google search, I was able to look-up the length of the run way by searching, "Taveuni Island Airport length", which is now named Matei Airport (i'll store that one away fro a future Jeopardy question). Thanks for the hunt, Dan! The airport has one runway which is 910 metres (2,986 ft) in length. Search result for "DQ-TRI" in picture resulted in : registerd with fiji airlines.. In image search, entering "fiji airport" one of the picture was spot on! 1. The airport has one runway which is 910 metres (2,986 ft) in length. 1. Dragged the image from your page to google image search. Best result was "Air Fiji"
2. Did a google search for Air Fiji and selected the wikipedia article. 3. On the wikipedia Article there is an image that is of the exact same spot as your image. It gives them name of the airport. It also has a link to the wikipedia article regarding the airport. The link gives the answers to both questions. What do I know looking at the photo? 1. I can search by aircraft registration: DQ-TRI. 1.a was a Tri-Islander registered to Air Fiji per . Therefore, runway length is 2986 ft. The photo was taken before May 1, 2009 when AirFiji ceased operation. I searched for <"dq-tri" airplane>, found the Air Fiji entry in Wikipedia (http://en.wikipedia.org/wiki/Air_Fiji), where the plane was listed for sale (when the airline went out of business). Upon looking for the airline's home airports, I found this pictures (http://en.wikipedia.org/wiki/File:2004.03.12_06_Air_Fiji_Matei_Taveuni_Fiji.jpg), taken from the same angle as yours. The description states it was shot at Matei airport (http://en.wikipedia.org/wiki/Matei_Airport). Also cross-referenced the photo with the Fiji version of that page (http://hif.wikipedia.org/wiki/Matei_airport), where the same photo is found. 1. The runway is 910 m. (2,986 ft.) long. 2. Coordinates of are: 16°41'26"S 179°52'37"W.
This is Matei airport on the island of Taveuni, Fiji. Near the bottom of this page is a photo of the same plane. This provided the general locale: Fiji. It also indicated the airline was Air Fiji (which you had apparently airbrushed off the plane's tail -- save for a tiny bit of the "R" in "AIR"). A satellite view of the home airport (Nausori) convinced me that the picture was not taken there. At that point, I assumed it must have been taken on an outlying island. But which one? This page lists all the destinations previously serviced by Air Fiji. But it also has a couple photos on it, to which I initially didn't pay enough attention. That photo -- http://en.wikipedia.org/wiki/File:2004.03.12_06_Air_Fiji_Matei_Taveuni_Fiji.jpg -- bears an uncanny resemblance to your photo (in particular, the pattern of grass and concrete). 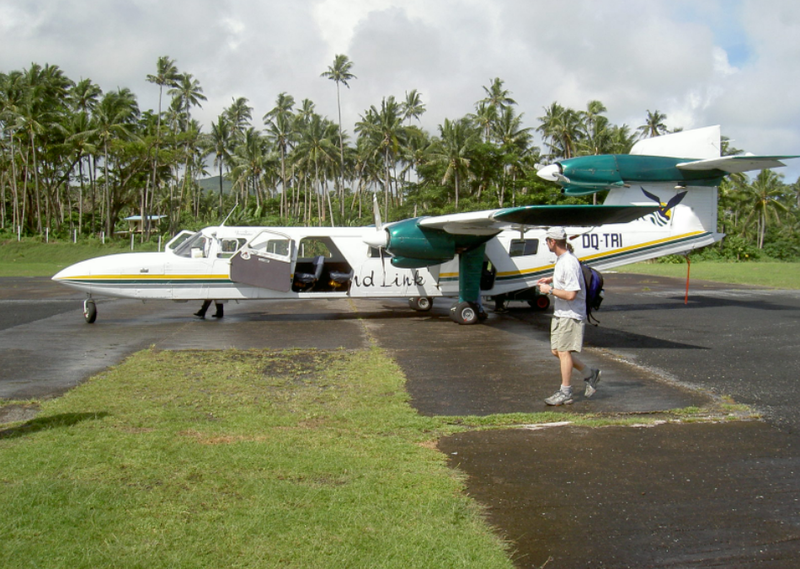 The photo is labeled "Air Fiji plane at Matei Taveuni Fiji". This page lists both the runway length and coordinates. 15 minutes total, broken down as follows: 2 minutes to identify the plane, its general locale, and eliminate Nausori as the airport; 12 minutes of fruitless image searching and checking satellite imagery before recognizing the thumbnail on the "Air Fiji" Wikipedia page; 1 minute to look up Matei Airport and get the answers. But Air Fiji doesn't return the exact airplane logo. So i think the problem is the time when the picture was taken. Go to wikipedia looking for air fiji and voila... a picture taken in the same place (with another airplane) but the SAME place. Then, using the google maps Distance Measurement Tool and the satellite view the runway is 1km long. Total research time nearly 10 minutes most of it wasted looking for the airplane (model and/or) logo. First did an image search using your image in the post. Results said "Best guess for this image: air fiji"
The Wikipedia page for Air Fiji http://en.wikipedia.org/wiki/Air_Fiji listed 16 airports that they serviced. I thought since the question was about length of runway I might be able to narrow it down based on runway length required for the plane. That wasn't the case since the Trislander was known for being able to takeoff on very short runways. I then went to looking at images for each airport for any clues. I eliminated some based on airstrip surface. Others I ruled out because they were to big. I found 2 airports that seem possible. I'm interested in seeing how others went about to solve this. 1. The runway is 910 meters long. 2. Matei airport is located at 16°41′26″S / 179°52′37″W. The answers took me around 10 minutes. I searched for "DQ TRI", but I saw a series of DQ triathlons, so I added airline to "DQ TRI" which revealed Air Fiji as the fleet operator. Wikipedia's entry on Air Figi provides an illustrative photograph that resembles the location of your photo to such a great extent that I am sure it is the exact same spot. It said Taveuni Island Airport (aka Matei Airport). All the information I needed was provided in the wiki infobox for Matei Airport. The runway is 910 metres (2,986 ft). It took me about 10 min to find this, if that, but I have to say that I got lucky. I took the most obvious text information in the photo - "DQ-TRI" on the side of the plane in the photo. I did a search on that and then refined the query twice before I hit it. The Wikipedia page for Fiji airlines was the first Google result for the 3rd query and that page contained a photo very similar to yours. I'll working on the year and get back with that. I only had a few minutes for this but so far I've figured out that this plane was operated by the defunct Air Fiji airlines which operated as an inter-island airline until 2009. I haven't yet figured out exactly which airport this is. At first I thought there were only 2 airports (Nausori & Nadi) in Fiji, but searching for "air fiji route map" gave me this map: http://www.airlineroutemaps.com/Oceania/Air_Fiji.shtml showing there are several other smaller airports/routes. My next step, if I have time, will be to try to figure out which route(s) this plane would have operated on. That could be based on things like range of the plane vs route distance, etc. or going back to the pic to see if there are any hints there as to which of these airports it might be. Took about a minute or two - looked up via the plane number, which led to a wiki page. That wiki had a picture with nearly the same field of view. The picture was captioned with the airport name --> wikipedia has the length and coordinates. Not too sure about how to go about finding the age of the picture though. Good challenge :). As for when the photo was taken, all I can say is that it is likely between April 2002 and December 2008. April 2002 was the registration date of the plane (via jetphotos.net); in December 2008, the Air Fiji fleet no longer included DQ-TRI (via Wikipedia). The palm trees in your photo look nearly identical to the 2004 photo on the "Air Fiji" Wikipedia, but that is far from definitive. I also spent time trying to figure out when stripes were painted on the Matei airport tarmac. Neither your photo nor the 2004 Wikipedia photo seem to have them while more recent photos do, but I didn't turn up anything more precise. On the assumption that you dove while there, I also tried to find any mentions/photos using your name as part of the key. No dice there either. It took about 1 minute to discover that Matei - Taveuni Island - Airport, Fiji has a runway that is 910m, 2,986ft, long, and is at 16°41′26″S 179°52′37″W. I Googled "Aircraft DQ-TRI" and hit the 5th entry in the list - the Wiki entry on Air Fiji. There just happened to be a photograph on the page of an airplane parked in *exactly* the same position as DQ-TRI, and there was a link to Taveuni Island Airport under the pic. That page of course gave the co-ordinates & runway length. Have to say, I used to BE a police detective (London, England), and while luck plays its part in that world, too, I never got THIS lucky when I was in The Job! In fact, I used to get about as lucky as I have trying to find the year the photo was taken - I've spent nealry half an hour like a dog worrying a bone, and as much as it irks me to say it - I give up. Search Air Fiji. Matched Photo on Wiki. Runway is 1,868 meters long. I did the search in about 6 mins due to being at work. Did a search by the plane tag sign in the photo DQ-TRI which gave me the Air Fiji and led me to their main airport in Nausori. The picture had to be taken before 2009 but after 2003. However, the year is much tougher. Wow, this was a great challenge, I really enjoyed it. Having said that, I gave up about 1hr in. Those Fijian airports all look the same! I had Matei tagged as "likely" but no definite proof. I had similar results to other posters, re Taveuni Island, using the wikipedia page. First I typed "dq tri plane" into Google. The first result was 'Air Fiji - Wikipedia'. I clicked into it and saw a picture with exactly the same background. The caption indicates that it is the Taveuni Island Airport, also known as Matei Airport. Using Wikipedia, I got the lat/long. Then I located the airport on Google Maps and switched to satellite view, using the distance measurement tool yielded the result of 974.842m. Figured it out in 1 mins. The door shows "nd link" which must be island link airline DQ-TRI. I just searched "Island link airline DQ-TRI" in google and came across the wiki article which has a picture of Matei Airport. So that must be it! I copied and pasted the image into Photoshop and came up with the following info: 2008/07/30-18:05:41. So my guess on when it was shot was July 30th, 2008 at 6:05:41 PM. Spent less than 10 minutes on this one. The airport information took me about 4 minutes, and was a little different than most people, though they had the better method. I googled DQ registration to establish that it was registered in Fiji, googled "Fiji Airlines" and saw a picture of an Air Fiji tail. The Air fiji Wiki had a nearly identical picture identifying Matei as the airport. Matei's wiki had the coords and length. 910 meters refers to the REPAVED length, and it is most likely that the actual runway in this photo was still gravel (not the loading area shown) at the time. So 910 is approximate. The interesting part is the year of the photo. It took much longer, I'm still working. I can't pinpoint it, but I think I got about as far as anyone else. First, no date on the photo's exif data. I searched "DQ-TRI registration" to find the year the plane was registered. 2002. Taken out of service in 2006. It HAS to be in those years. I tried to see if they changed its paint scheme in that time... no luck. Matei was paved recently, but I realized that was post 2006, so it's moot... Then I started to look for any travel Dan Russell did. A bunch of work in Hawaii in 2005, so I entered that in as my best guess. Diving side trip? Though I saw from the published works on his site that he also visited Hawaii in 2004... So this is all flimsy. The date may be correct but the time of day on the photo is suspect. The general time of sunset for Jul 30, 2008 was 5:51. PM. The shadows don't support 6:05 PM. Like the others it just took a few minutes to get the airport information. I also looked for EXIF or other embedded information in photo file for the year, without luck. PNG files don't support EXIF. 2008/07/30-18:05:41 that Steve E. found is an Adobe version date, not specific to the image. Looked in your CV to see when you were at conferences in Hawaii, but it seems like that is every year. Perhaps the "nearly impossible" statement means just that. Is this a test to know when to quit because the information is not available on the internet? Googled 'DQ-TRI plane number' (the number on the tail on the plane), first result being wiki page for Air Fuji. On the wiki page had a similar image showing another plane on the same spot of runway, which links to the page for Taveuni Island Airport. checked plane type which is a "1976 Fairey Britten-norman Ltd BN2A MK.III-2 TRISLANDER serial 1041 3 engines"
Mixed the two and found a picture of the plane on Suva which matched. "910 metres (2,986 ft) in length." The coordinates are: 16°41′26″S 179°52′37″W. Did the search before looking at the comments. Call sign DQ-TAI (I know misread it) but found out this was a Fiji call sign, and found out the logo on the plane is the same a Fiji Air. Further search showed a similar picture which has the same characteristics as the picture given (i.e. grass growing through the asphalt, the trees in the background etc.) which lead to the answer of Taveuni Airport or now called Matei Airport, 910 Meter runway and the following coordinates 16°41′26″S 179°52′37″W. For the bonus question, I look at a hint from a previous poster, when he mentioned that a search for your dive trips didn't give much. I found a picture which listed a number of your fellow divers : "Divers in the photos include Harry Saddler, Dan Russell, Tom Gruber, Richard Santucci, Laurie Damianos, Anne Aula and Geoff Davis." It looks like this picture was taken when departing, so I would guess the day after the last Fiji picture. i.e. 24th March 2004. I could not establish if you were part of that trip. Nicely done. I knew about Tom's picture on Flickr, but that was an outstanding solution path for you to discover. Nice. "An Air Fiji Harbin Y-12 at Taveuni Island Airport, Taveuni Island, Fiji. (2004)"
So it was registered in 2002 and dismantled in 2006 to be rebuilt and sold. Currently stored in Suva. 910 metres (2,986 ft) in length and lat/long at 16°41′26″S 179°52′37″W.